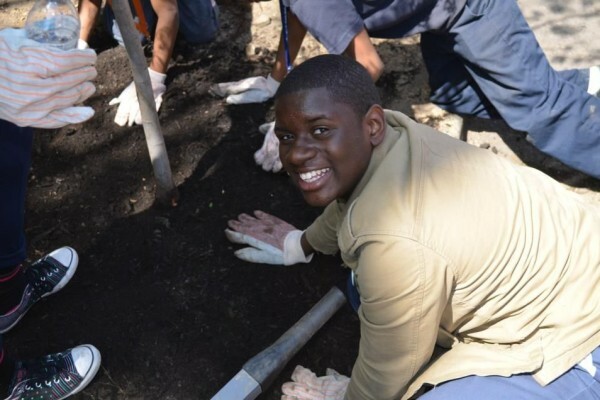 Mulching keeps trees happy and healthy! It’s summer time! Time for BBQs, splashing in the pool, and going on vacation – just make sure you don’t take a vacation from caring for your tree! During the summer months, your tree needs you more than ever. This is the time when water is scarce, and weeds take over. Check out these simple tips for keeping your trees happy and healthy this summer. 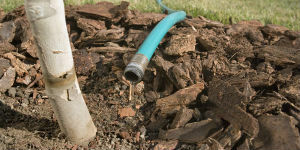 Newly planted trees need to be watered for at least the first 2 or 3 years in order to establish in their new home. 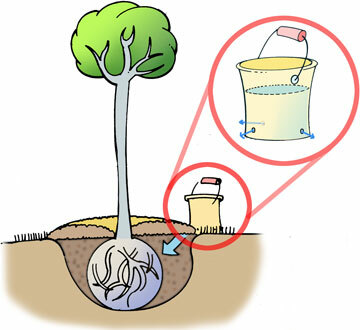 The best way to water is by letting water trickle slowly into the root zone of the tree over the course of a few hours, once a week. You can use a garden hose set to a slow trickle, a five gallon bucket with holes punched in it (see diagram above, refill two or three times), or a watering bag. Gardeners know that in July and August, weeds take over! Weeds and grass that grow too close to your tree can steal water and nutrients, and lead to damage from lawnmowers. 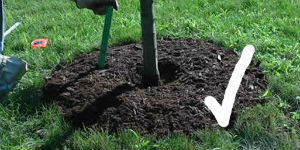 Make sure your tree is properly mulched using the 3-3-3 rule: leave 3 inches of free space around the trunk for air exchange, spread the mulch in a donut shape 3 feet from the trunk to keep down weeds and grass growth, and pile the mulch 3 inches high to keep the roots from drying out too quickly. Follow these simple rules for a tree-mendous summer!